I have slowly been accumulating items to use in my girls' room. I will be redecorating it soon. I will confess that a couple of the things I've found have actually made their way into my room. Oops! You won't tell them right? These things however, I cannot wait to lay on their beds. This quilt was made with love by Lora at Eager Hands. You must go check out her shop! 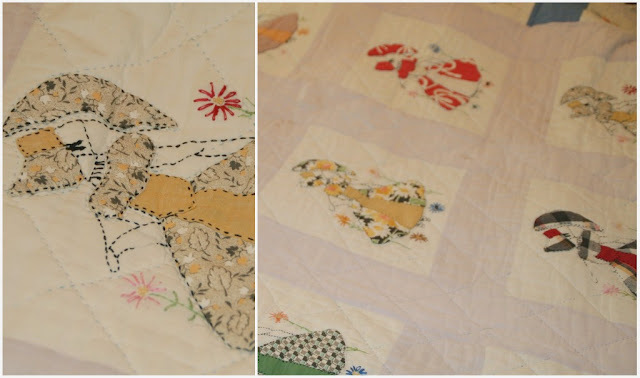 She lovingly sewed vintage sheets onto this beautiful quilt. And my favorite part? The note she sent me describing the way she prayed over my girls as she was sewing. Praying for their relationship and their purity. I couldn't be happier with the outcome and Lora's hard work means so much to me. I just adore the girls wearing bonnets and the hearts she sewed onto the areas that needed a little extra TLC. I couldn't resist this beautiful quilt! The same type of square pattern and the ladies with their hats an umbrellas? It was calling my name. I need to have a few repairs made to it but it's going to be perfect. I'm so excited to get started on their room and cover their beds in these lovely finds. I love your quilts. They are so sweet and girly. Thanks for sharing. Oh I love quilts! They are so timeless and lovely! And what a blessing to have such a godly and beautiful lady working on it for you! NICE! i can't wait to see the finished project. Such beautiful work-I love the prayer and love that was put into them! Just perfect. PRECIOUS. what a beautiful pair of quilts! and so amazing lora's sweet prayers as she created that masterpiece. wow. I love this. Everything about it. The quilts. The prayers. The look of the new room. Lorna. You...It's all just wonderful. There's something about quilts that just speak warmth and protection and loving hands. How wonderful that you will blanket your girls in these things. I just love quilts! One can never have too many! I love them!!!! So awesome! 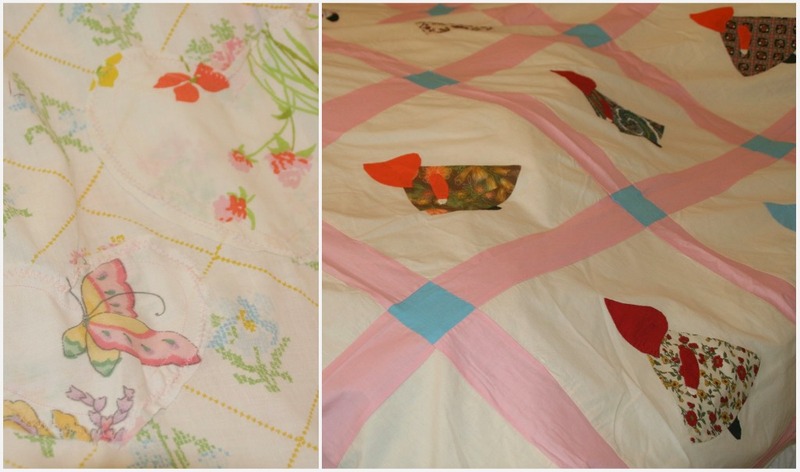 These are such sweet quilts! They remind me of Holly Hobbie from my childhood. I finally posted my first quilt today. I think Ive found a new hobby(as if I needed to add in another). Making a quilt can be very therapeutic I found out! Oh my goodness what a wonderful quilt - turned prayer quilt you will have... knowing every stitch had their little souls in mind. Great find - that second quilt is so sweet.